Truly Extraordinary Sleep, Study, And Storage. A Complete Youth Bedroom In The Space Of A Full Size Bed. 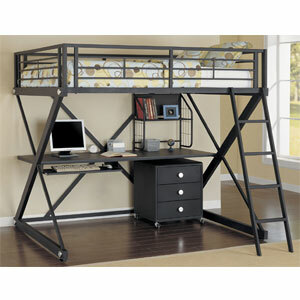 This Versatile Loft Bunk Includes A Full Size Upper Bunk And A Study Desk Unit Underneath. The Desk Work Surface Is Set Up To Handle Computers Or Video Games, The Pull Out Keyboard Tray Will Fit Any Of TodayÃs Keyboard Technology, And The Suspended Storage Shelf Complete The Features. Made Of Heavy Gauge Powder Coasted Tubular Steel End Frames In The Unique Z-Bedroom Shape, Brushed Chrome Trim And Machined Aluminum Decorative Caps, And Black Hi-Pressure Laminated Work Surface Give This Study Loft The Rugged Construction To Survive In Any Youth Environment. Strong Construction. Some Assembly Required. Also Available(Not Included In Price) Matching Z-Bedroom Mobile 3-Drawer Chest. Strong Construction. Caster Assembly Only.